A listing of blogs by people with narcolepsy. Here you will find all the blogs I could find that discuss the experiences of people with narcolepsy! I really recommend that you take the time to read some of them, especially if you have only recently been diagnosed, as reading about other people’s experiences with narcolepsy can be extremely validating. It helps you realise just how many parts of your life are affected by narcolepsy, some that you might not have noticed before, or may have simply put down to a personal failing. The knowledge that you are not alone is extremely therapeutic, trust me! I have tried to keep this list to currently updating blogs, only so that the info you read is current and still relevant. I also tend to lean towards blogs that are generally positive in tone. Don’t forget to check out my own posts on the Elle’s Blog page! If you have spent any time in the “narcoleptic community”, you have probably come across Julie Flygare, narcolepsy advocate, blogger and author of Wide Awake and Dreaming, her memoir describing her personal struggle with narcolepsy. 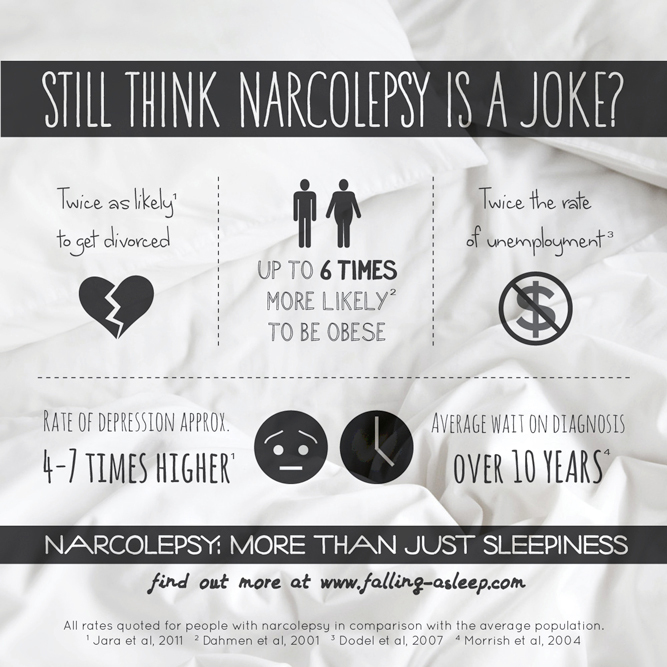 Her blog is equally helpful in describing her experiences, different aspects of narcolepsy, how it feels to have narcolepsy before diagnosis, tips on dealing with narcolepsy and a section with narcolepsy information including an infographic. Julie is an inspiration and an amazing advocate for narcoleptics everywhere, and started the amazing Narcolepsy: Not Alone campaign. Michelle has only been recently diagnosed with narcolepsy, but she has been pretty prolific in writing about it ever since. I love Michelle’s style (she also posts about her creative side and her new fashion business) and her attitude to life. She’s also been writing a lot about the process of starting Xyrem, which is a good example of how great the effects can be, and I think would be really useful to anyone who is considering going down that path. Ilana is a young woman with multiple conditions including narcolepsy, and writes some great, really informative blog posts about dealing with chronic illness in a proactive and positive way. Her posts are often filled with very practical advice, e.g. tips on how to deal with your condition in a workplace setting and dealing with weight gain. Elaine is a young person with narcolepsy who recently spent time living in Spain! I loved reading her posts, clear but interesting descriptions of everyday life occurrences that seem normal to those of us with narcolepsy, but probably not-so-normal to others! She also discusses her ups and downs of taking Xyrem. Gina has had a LOT of experience with narcolepsy; she has not only had narcolepsy almost her whole life, but also has a son and an ex-husband diagnosed with the same condition. Despite all this she is now making the most of life medication-free thanks to dietary changes, and wants to help others get relief from their symptoms by sharing lifestyle tips, recipes, and the science behind it all with others. This blog is written by Claire, who doesn’t have narcolepsy herself, but has a child with narcolepsy. Claire is an author and has written about her family’s experience in relocating from London to LA in order for her narcoleptic daughter to gain access to Xyrem in the book Waking Matilda. Look to the “On Narcolepsy” section of her site to read some of her blog posts on the topic. A relatively new blog, Allison speaks about her experiences, thoughts and feelings surrounding living with narcolepsy and chronic pain. She also discusses how these struggles intersect with her faith, and while I’m not personally religious, I found it interesting to read about her perspective. This blog is written by a couple, Devyn and Hannah. Hannah has narcolepsy and her husband Devyn is quadriplegic. This blog is a great description of their life together and how each of their conditions affect their relationship, and also of how it feels to be a newly-diagnosed narcoleptic. While not totally up my alley (i’m unlikely to give up my medication any time soon!) I think anyone can learn something by reading through this blog about dealing with narcolepsy in a wholistic manner. Also a parent and a nurse, this blogger has written some very comprehensive posts ranging from going gluten free to information about gaining disability benefits. This blog is very focused on health and fitness, and how they can help battle the symptoms of narcolepsy. The author, Heather, is a wife and mother, who also believes in the benefits of a gluten free diet. Tove’s blog is not strictly about narcolepsy, focusing mostly on parenting, but her occasional posts about her condition are definitely worth a read! These are some blogs that haven’t updated in over a year (at the point I last checked), but might still be of interest. A blog by the lovely Alanna, who I have head the pleasure of meeting a few times 🙂 She blogs about her everyday experiences as a young woman, person with narcolepsy and a ballet dancer. Very well written and reflective. You can tell just by reading her blog that Grace has an amazingly positive outlook on life. Refusing to give up on her dreams because of narcolepsy, she is currently traveling around Asia and documenting her narcoleptic experiences along the way. A rarity of the blogs I have found, this one is written by a male! This is a very personal and honest blog all about this man’s family life (father of four boys!) and his narcolepsy, and how the two interact. Experiences of a young woman living with narcolepsy and cataplexy. Her posts talk about everyday life and how she copes with it, as well as dealing with the constant paperwork that many of us deal with due to our condition. This blog is a good one particularly for parents with narcolepsy, but also for anyone else. Written by a single mum, her posts often deal with the daily life of a parent with narcolepsy and the guilt that can be involved in that, and she is very concerned with the psychological and sociological impacts of narcolepsy, which is a pet rant topic of mine. This blog is not directly about narcolepsy, but is actually a dream log by a woman called Eliza who has narcolepsy. I love hearing about other people’s dreams, and Eliza’s descriptions are well-written and reflective. Gives you a good idea of how vivid and emotionally-involved narcoleptic dreams can be.